Home > Heart Diseases > What Are The Risk Factors Of Congestive Heart Failure? Congestive heart failure is a very serious disease. It is a long-term medical condition which gradually becomes worse. It is a condition where the heart loses its pumping capacity with time. It can result from any functional or structural cardiac disorder impairing the heart’s ability of pumping or filling with good amount of blood throughout the body. Congestive heart failure should not be confused with heartbeat cessation or cardiac arrest that can result in the death of an individual. 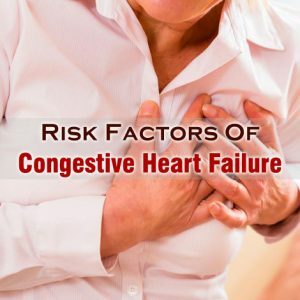 Congestive heart failure can be treated effectively but there are some risk factors for this condition that need to be taken into consideration. The risk of congestive heart failure increases with the advancing age of an individual. Congestive heart failure is one of the most common reasons for the hospitalization of people above 65 years of age. Gender is also one of the risk factors for congestive heart failure. Men are always at an increased risk of suffering from heart failure in comparison to women. People who suffer from uncontrolled hypertension or high blood pressure are at an increased risk of suffering from congestive heart failure resulting in heart attack. Around 75% cases of congestive heart failure start with high blood pressure. This disease is primarily the end result of a complicated procedure known as atherosclerosis. This disease is one of the most common causes of heart attacks in people and it even involves the accumulation of unhealthy cholesterols in the arteries along with injury and inflammation of the cells in the blood vessels. Congestive heart failure in people suffering from coronary artery disease generally results from localized pumping defect in the heart. Having irregular heartbeat is another heart condition that can result into congestive heart disease. Abnormal rhythms of the heart especially if the rhythms are fast and frequent can weaken the muscles of the heart and can result in congestive heart failure.